The Three Caballeros is another Disney animated feature I hadn’t seen before, although the Caballeros were in the middle of the swimming pool of the hotel where Beth and I stayed on our Walt Disney World honeymoon. This was basically a follow-up to Saludos Amigos, but it had a little more cohesion than that collection of cartoons. The framing story is that Donald Duck has received birthday presents from his friends in Latin America, and those lead into the individual segments. The first present is a movie projector, which shows Donald a short about a penguin who hates the cold, narrated by Sterling Holloway. This cartoon takes a little while to get anywhere, but it has some pretty good geography-based gags once Pablo the Penguin reaches South America. There’s a cameo appearance by Neptune, who looks kind of like he stepped out of an old comic strip. I think Walt Kelly of Pogo fame might have had something to do with the design, which would explain it; I know he drew the comic adaptation of the movie. Then there’s a documentary of sorts on rare birds, which introduces the bizarre Aracuan Bird. 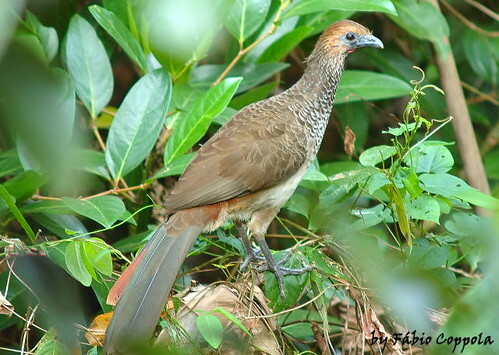 The proper name for this sort of bird is the East Brazilian Chachalaca, and it really does have a noisy song, but looks nothing like Disney’s design. Actually, considering his appearance and over-the-top wacky personality, I have to wonder if the Aracuan was Disney’s answer to Woody Woodpecker, who had been created just a few years earlier. The bird would go on to annoy the other characters with goofy gags a few more times in the film. Another short is about a young gaucho who befriends a flying donkey, and…well, that’s really about all there is to it, but it’s pretty cute. The next present is a book on Brazil from José Carioca, who somehow managed to get himself inside the book. He shrinks down Donald so the duck can join him (who comes up with this stuff, anyway? ), and the two of them visit the city of Baia, where Donald shamelessly flirts with Carmen Miranda’s sister, who’s in live action. I wonder what Daisy thought when she found out. Actually, Donald hitting on live-action Latin women is a recurring theme in this movie, and it gets pretty disturbing. Even the other characters end up being bothered by it. The blending of animation and live action is rather awkward, never really producing the illusion that the people were interacting with Donald, but it WAS early on in the usage of such techniques. Roger Rabbit wouldn’t show up for more than forty years after this. After this, we’re finally introduced to the third caballero, and it’s about time too! 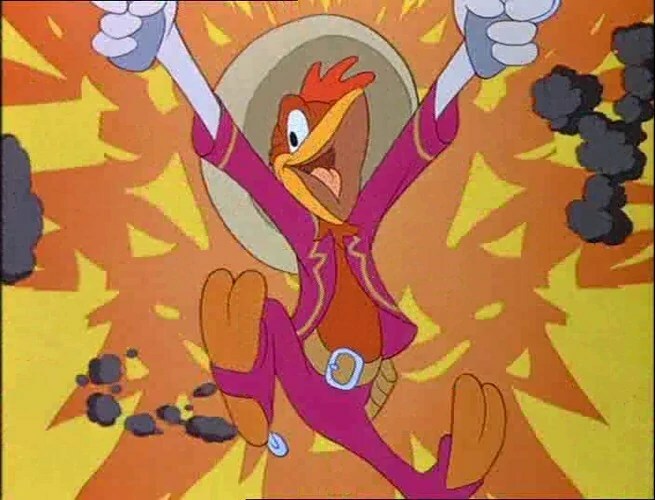 This is Panchito Pistoles, a Mexican rooster who fires his pistols with reckless abandon, sort of like Yosemite Sam. 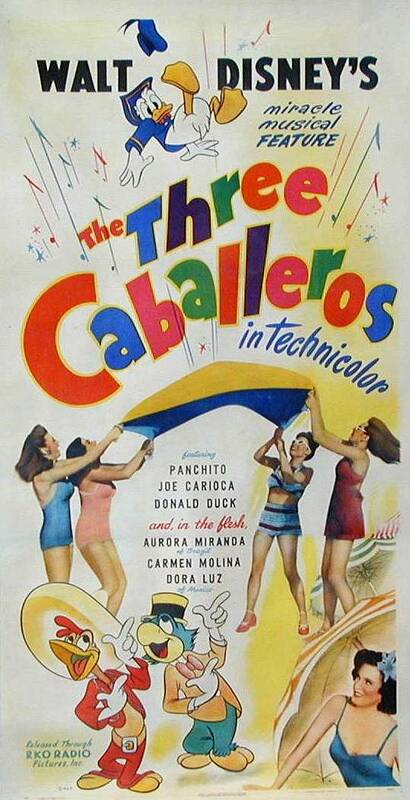 The three birds sing a song about being caballeros, which is easily the highlight of the movie. Panchito teaches Donald (and the audience) a few things about Mexico, and brings the duck to a beach where he chases women around. And that’s the part of this Mexican sequence that actually makes a little bit of sense. Most of the rest is totally surreal, and has been compared to the pink elephant scene in Dumbo. I tend to be a proponent of surrealism, but what happens here never really goes anywhere, and mostly just feels like padding. It does, however, include the song “You Belong to My Heart,” which I’m pretty sure I’ve heard used somewhere else as well. I mean, it’s not surprising that I’ve heard it before, as it’s been covered by everyone from Bing Crosby to the Old 97’s, but I think I heard it in a TV show or another movie. I think what bothered me the most about this movie was the wasted potential. 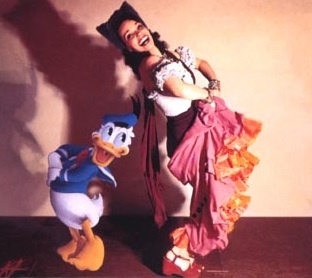 I like the characters of José and Panchito and their interactions with Donald, but so much of the movie is made up of extended dance scenes and hallucinations that they never really get a chance to DO anything together. And while the scenes about Donald’s birthday help to tie the film together, most of the segments don’t have much to do with each other. This entry was posted in Cartoons, Revisiting Disney, VoVat Goes to the Movies and tagged aracuan bird, aurora miranda, disney's all-star music resort, donald duck, east brazilian chachalaca, jose carioca, neptune, panchito pistoles, the three caballeros, walt disney world, walt kelly, woody woodpecker. Bookmark the permalink. Wait, I thought Latin America was nothing but “made up of extended dance scenes and hallucinations”? That’s what Ricky Martin, Shakira, Carmen Miranda, and I Love Lucy would have you believe, apparently. True. I suppose Disney was ahead of their time in that respect. By the way, don’t forget Homer Simpson’s hallucination after eating Guatemalan insanity peppers.